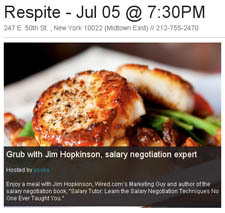 Jim talks about his experience using Grubwithus.com, a new startup fostering social meals, group dining, and meeting new people. Facebook, Twitter, LinkedIn, IM, Blogs, Forums, Multi-player games, Tumblr. Let’s face it. We all have PLENTY of ways to meet other people ONLINE. What we really need are more ways to meet people socially — in real life. – Studies show that up to 80% of jobs are found through networking. – Salespeople have long known that face-to-face meetings are crucial. People like to buy from people they like and people they’ve met. – While online dating has exploded and the chances of meeting your soulmate in a bar after 2am dwindle, the sweet spot of putting yourself in social situations with people you have things in common with is a pretty good option. – And finally, if we all don’t stop spending 12 hours a day staring at some kind of screen, a little bit of our soul gets lost. That’s what makes GrubWith.Us, a new service that is using the power of the web and social media to get people interacting over great meals, so interesting. GrubWithUs comes from renowned startup accelerator Y Combinator, which has kick started many new companies, including Conde Nast-owned reddit.com. In fact, it was reddit co-founder Alexis Ohanian who made the initial introduction. The company was founded by Daishin Sugano and Eddy Lu with a simple concept: How do you meet people when you’re new to a city? The friends had relocated from California to Chicago to start another company, and realized that dinner parties are a great way to network. The idea took off and they were recently profiled in Steven Levy’s amazing WIRED Magazine piece, Y Combinator Is Boot Camp for Startups. As of June 2011, GrubWithUs was hosting meals in six cities – Chicago, New York, San Francisco, LA, Washington DC, and Boston – with Seattle and Atlanta coming soon. That kind of expansion, the seal of approval from Y Combinator, and a little bit of frothy internet investment buzz brought the investors running, to the tune of $1.6 million in first round funding, including buy-in from Ohanian himself, Marc Andreessen, and Ashton Kutcher. Of course, who needs any more press after you’ve been mentioned on The Hopkinson Report podcast, but it doesn’t hurt when you’ve had the requisite coverage on Techcrunch, a nice write-up in The New York Times, and interviews as you enter a new city like Washington, DC. 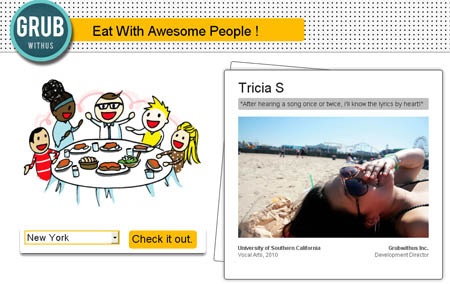 1) Browse though listings and find people to eat with and/or places to eat at. 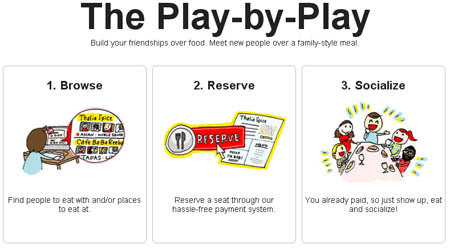 2) Reserve a seat through their hassle-free payment system. Meals are usually in the $25 range, although current listings show a $44 meal at a higher-end location in New York City and a $15 meal at a Thai restaurant in DC. 3) Show up, eat and socialize! Most meals have 6-8 people. The reason GrubWithUs could endure and be successful like Meetup.com or Groupon (two sites that they’ve been compared to), is that it works for all three parties involved. 1) For attendees, it fulfills a need. It allows people new to a city, people looking to flirt, or people looking for business ideas to connect with a new audience in a simple way. The money for the meal is paid up front, so there’s no haggling over the check at the end of the dinner. Everyone is in the same boat. 2) For the restaurants, it’s a new form of marketing, and gets a large group of social people in the door. The website shows beautiful photos of the meal, as well as the menu of what will be served. They also position themselves as attracting a higher-end social audience, as opposed to a Groupon audience that might be only searching for a low price deal. 3) It works for GrubWithUs. They approach the restaurant with a value proposition of bringing in brand new clients, and charge a fee to help set everything up. So far I’ve told you how GrubWithUs usually worksâ€¦ 8 strangers get together and meet for the first time and the talk leads to wherever the conversation may flow. But they also have some variations. One example is a charity dinner, where users pay a much higher fee to attend the meal, with the remaining proceeds going to charity. The twist is that the host of the meal are the co-founders of a Silicon Valley investment team. Once again, it’s win-win-win all around. The VCs get to meet new people, money goes to charity, and the glassy-eyed startup hopefuls get 2 hours of advice, the chance to pitch their business plan, and the dream of being the next company to be founded. So when Alexis introduced me to co-founder Daishin and mentioned that I had just published a book, a light went on and we hatched a plan. The result? It sold out in 1 hour. As for the experience, it went exactly as advertised. The people were very social and friendly, the food itself exceeded my expectations, and the conversation was lively. – Then I had each guest introduce themselves and give their story. – Finally, I tried to address each situation individually, and the whole group learned from the experience. The result of the second meal was similar. A great group of people with various backgrounds. They were a little less interactive – maybe it was that they were more polite – but even though I forced myself to stop talking about Salary Tutor tips and ask them for feedback and questions, I found myself talking a lot, coming up with example after example of ways to help them negotiate. We did a few role playing examples of what to say during negotiation, and it was fun seeing them get nervous the first time – as almost all people do – but to really own it and nail it by the end of the night. 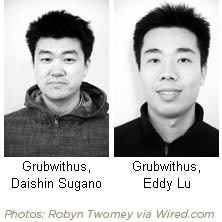 Will GrubWithUs expand to Meetup’s 45,000 cities or Groupon’s multi-billion dollar valuations? Not likely. The service is too removed from being a purely web-based business to grow that quickly. But can it get people hunched over their laptops with a Red Bull to leave the house and hunch over a Chicken Kebob platter with a redhead? This entry was posted on Wednesday, June 29th, 2011 at 10:15 pm and is filed under Marketing Case Studies, New York City, Social Networking / New Media. You can follow any responses to this entry through the RSS 2.0 feed. Both comments and pings are currently closed.